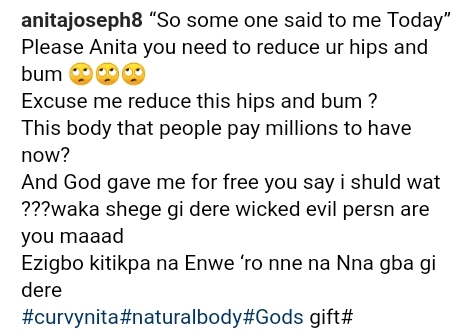 Nollywood actress, Anita Joseph has cursed a ‘friend’ who asked her to try and reduce her hips and bum because they are too much. Excuse me reduce this hips and bum ? This body that people pay millions to have now? And God gave me for free you say i shuld wat waka shege gi dere wicked evil persn are you maaad. Ezigbo kitikpa na Enwe ‘ro nne na Nna gba gi dere”.